Vivo, which unveiled its latest flagship phone the V7+ just a few days ago with the country’s most revered love team Kathryn Bernardo and Daniel Padilla headlining the roster of celebrity endorsers, goes on a series of promotional mall tours to further promote the brand. 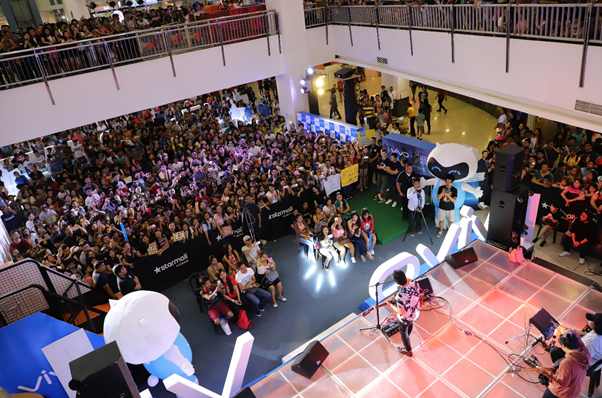 The first leg of the mall tour commenced last September 23 and 24 with acoustic singer-song writer and Vivo Family pioneer TJ Monterde serenading eager fans. This first taste of the Vivo mall tour was just the beginning of a few more in various malls around the metro which will carry on for the rest of the year. TJ Monterde will make a comeback in the mall tour to give fans a taste of good music from September 30 to October 1 at the San Jose Del Monte – Mall Atrium. TJ’s appearance at this Vivo mall tour north of Manila will simultaneously happen alongside a mall tour at the south side at SM South Mall Lower Ground Atrium with The Voice Kids runner-up Sassa Dagdag and teen-hunk Paul Salas. Sassa Dagdag and Paul Salas, both pioneer Vivo Family members and who are both recently marking their own spot in the entertainment scene will grace the mall tour with their superb singing prowess as Vivo endorsers. On October 1 and 2, on the other hand, boyband fans will certainly scream with excitement at an SM Megamall Event Center leg of the Vivo mall tour with the celebrated Boyband PH composed of Joao Constancia Niel Murillo Tristan Ramirez Russell Reyes Ford Valencia. The four-month mall tour intends to bring Vivo products most especially the newest Vivo V7+ closer to the brand’s target audience. The Vivo V7+ is proven to be the fastest-selling smartphone to date, already receiving more than 5,000 pre-orders. Already available this September 30, the V7+, the latest pride of the 5th in the 2016-2017 Leading Global Smartphone Brands, boasts of a world-first 24MP clearer selfie front camera, a Face ID security access, and a 5.99” all-screen display. The pre-orders shot up mainly because of the V7+’s top-of-the-line features. The V7+, a selfie-centric phone’s front-facing 24MP camera rocks LED flash and smart photography algorithms which produce sharp and natural-looking photos. The V7+ also prides itself with its revolutionary 5.99” all-screen display with an 84.4% screen to body ratio, providing a more exciting and enhanced gaming and visual experience. Also, a special Face ID feature allows high-technology security access to one’s smartphone, unlocking the phone with mere facial recognition. The V7+ comes in Matte Black color and Crown Gold and is priced at a reasonable Php 17,990.00. The Vivo V7+ is selling nationwide and is available at Lazada, Argomall and all Vivo concept stores and kiosks.